Elegant, Breathtaking Views, Where Couples Enjoy Quiet Moments and each other! *** WILL RENT 1 OR 2 NIGHTS DURING 3 NIGHT MINIMUMS IF 1 or 2 NIGHTS ARE LEFT AVAILABLE BETWEEN RESERVATIONS. * SECLUDED, INTIMATE, LUXURIOUS HONEYMOON CABIN OR ROMANTIC COUPLES GETAWAY! * NEW AMAZING, SENSUAL LIGHT SHOW! COME SEE OUR ENCHANTED FANTASY BEDROOM! * AUTHENTIC HAND HEWN LOGS WITH VERY ROMANTIC RENAISSANCE DECOR FIT FOR A KING AND QUEEN! * NO STAIRS! ONE LEVEL OPEN FLOOR PLAN! * SPECTACULAR VIEW WITH LAYERS OF THE GREAT SMOKY MOUNTAINS! * NEAR THE PARKWAY AND DOLLYWOOD BUT OUT FAR ENOUGH TO BE PEACEFUL, SECLUDED AND SURROUNDED BY NATURE! * NOTHING BUT WOODLANDS ACROSS THE ROAD, NOT IN A RESORT SETTING, NO VISIBLE CABINS DOWN BELOW! * JETTED JACUZZI NEXT TO BED WITH MOUNTAIN VIEW! Love gives us a Fairy Tale! Knight of my dreams is an authentic rustic cabin decorated with luxury, romance and comfort in mind. This cabin is one level and has a completely open floor plan with only the bathroom being enclosed. Newly remodeled with new flooring throughout, new kitchen counter tops, microwave and dishwasher. Completely stocked kitchen with all new dishes, glassware, utensils, pots and pans. Everything you need to create that wonderful romantic dinner for two while watching the smoke move in on the mountains. Relax in front of a cozy fire, October 1st - April 1st, share stories or visit old memories. Whether you are sweethearts, just starting out, getting ready to tie the knot or in a seasoned marriage, knight of my dreams will bring spice and romance to your relationship. From past times of love and loyalty, when there were ladies and chivalrous knights to rescue them. You will feel secluded yet you are only about 5 miles from the parkway, shopping and entertainment. The living area has a reclining loveseat for two with drink holders with a gas fireplace available October 1st - March 31st and a 50 inch plasma television. The dining table seats 2 with a mountain view and a view of the fireplace to enjoy with your dinner. The jetted jacuzzi tub is located next to the bed and also has a view of the mountains to enjoy while soaking your cares away. The king canopy bed has a new memory foam pillow top mattress with a luxurious designer comforter. The light over the bed is hand made by an artisan, imported from Egypt and holds a surprise for you. The light turned on at night creates such an ambiance...Well we won't tell, it's a surprise, you will have to wait and see. What is a medieval cabin without a dragon and knight, we have those too. The deck has a new porch swing and bar height table and two chairs to enjoy the sunrise with your morning cup of coffee or enjoy a romantic dinner al fresco while watching the shadows and light dance across the mountains.We love to watch a storm roll into the layers of mountains. Relax in the hot tub and watch the ever changing mountain view, the sun lighting up the mountains as it sets or enjoy a star filled night sky with that special someone. Whatever you choose we know that you will feel the peace and love that surrounds you in this place. This cabin is rented by the owners. When you email or call that is who you will be speaking with. We are opening our home to you and we take pride in providing a completely furnished and clean cabin for our guests. Knight of my dreams is a beautiful and romantic cabin perfect for your honeymoon, anniversary or a special vacation getaway. We are Allen and Angelina from Marietta Georgia. We have been together for over 35 years and our relationship is a testament of true love. My husband and I love coming to the mountains to rekindle our spirits as often as we can. One of our favorite times to visit is during the Shades of the Past and Rod Run in September. We also especially love it in the winter, when the crowds have thinned and all is quiet on the mountain. We also enjoy soaking in the hot tub watching the snow fall under a night sky. Another favorite is a storm rolling into the mountains and lightening in the sky. It's spectacular, almost as good as the fireworks. Allen's family originated in the Tennessee mountains so there is a re-connect for us here. We chose this property for the feeling of seclusion and the views of layers of mountains that go on forever. We wanted to have something different to offer. Being a romantic at heart I went to work trying to capture the feeling of a medieval fantasy for couples to share. With Allen's creativity and patience, mainly with me, we put together a truly different and wonderful place to share with other couples to create new and lasting memories. Knight of My Dreams has dragons, knights and a touch of whimsy! We love the special feeling we experience when we are here and know you will feel it too! toilet, combination tub/shower, New commode and flooring. Hair dryer in the vanity. Away from it all, yet convenient to Pigeon Forge, Gatlinburg and Sevierville. Spectacular views of the Great Smoky Mountains. Built in over the stove. Brand New! Brand new dishes, glassware, utensils and pots and pans! Everything you would need to create that gourmet meal. Stocked with everything you will need to create a romantic dinner for two! We also have a Crockpot for your convenience. The mountain view and fireplace create a romantic atmosphere to enjoy with your dinner. There is also a high top table and chairs to dine al fresco and enjoy those incredible views! Brand new High Definition 50 inch plasma television. Brand new blu ray player. There are board games available for quiet nights together with a little competition. The deck has a hot tub with some of the most amazing views of the layers of mountains. There is a porch swing to dream your afternoon away and a high top table with chairs to enjoy dining al fresco! Enjoy time together surrounded by the beautiful mountains or a star filled night sky. Relaxing honeymoon with incredible views! 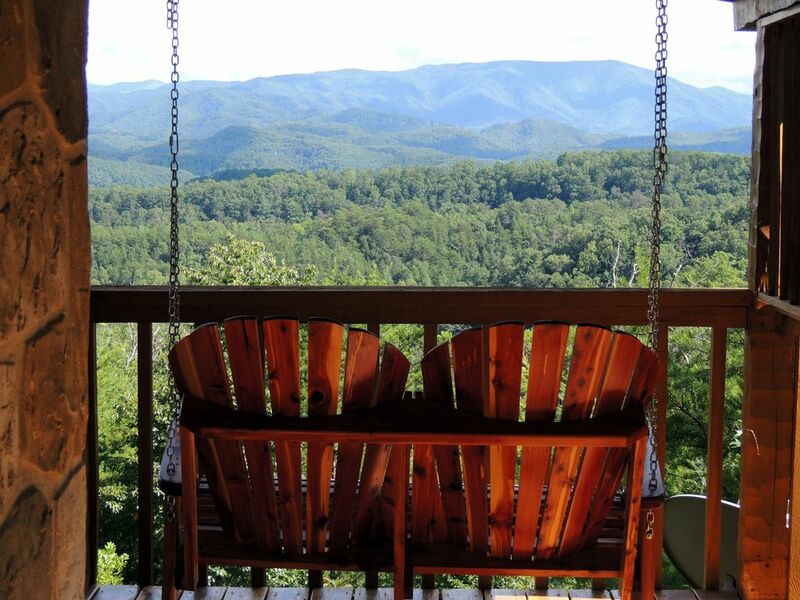 The views were incredible, the amenities were awesome, and the location was perfect - close enough to the Smokey's and Pigeon Forge and Gatlinburg! Angelina is incredibly thorough in ensuring that each guest is taken care of and has a good time. She's available to give information about the local area and the cabin. Would love come back again if the opportunity presents itself! We enjoy every moment of this place. The view was beautiful of the mountains and inside of the place was gorgeous. With the help with Angelina she made us feel at home. Plus gave us advise places to go. She was a big help. I would highly recommend this place again. A wonderful cabin in a mountaintop setting made for a fantastic weeklong getaway! Beautifully appointed cabin! View from the deck is breathtaking! Lots of things to do in the area. We can’t wait to return! We loved everything about our stay. Angelina is a wonderful owner and makes sure everything is perfect during your stay. The personal touches made us feel right at home and easy to relax and enjoy each other. You won’t be disappointed. Bob and Bethany... Thank you for taking the time to write a review for us. It is appreciated more than you could know. We are happy you enjoyed your visit to the Smoky Mountains. We try to make our guests feel appreciated and to enhance their experience while visiting the area. Glad you felt at home, we accomplished our goal! My wife and I spent our first few days of our marriage here at Knight of My Dreams, and it was absolutely perfect. Beautiful Scenery and a wonderful home made life easy. Angelina was super helpful as well, and the location was perfect. 10 minutes from plenty of things to do. We will definitely be spending another weekend here. It was hard to leave when the trip was over... Definitely recommend! Joseph and Christina... Thank you for this wonderful review! We are so appreciative to have made your honeymoon a special one at Knight of My Dreams! Those views, the seclusion and peacefulness at the cabin is the perfect setting to begin a new journey together. The proximity to all the fun is the icing on the cake! We would love to host the two of you and look forward to your next visit. Congratulations on your Nuptials!!! We had a wonderful time staying at "Knight of My Dreams!" We would definitely go back. We liked that it was secluded. We loved the views and the hot tub. The light show was neat, too. ;-) It was perfect. *** SEE OUR OTHER CABIN: Stairway to Heaven: VRBO.com/608082 *** *** OWNER CONTACT: ANGELINA for Questions Click on Ask Owner a Question located under Request to Book*** *** NEW ROMANTIC SENSUAL LIGHT SHOW! COME SEE OUR "ENCHANTED FANTASY BEDROOM" *** ** WILL RENT 1 or 2 NIGHTS DURING 3 NIGHT MINIMUMS IF THE DAYS ARE LEFT BETWEEN RESERVATIONS. CONTACT OWNER TO RESERVE! ** RENTAL RATES AND MINIMUM NIGHTS ARE SUBJECT TO CHANGE UNTIL RESERVATION IS CONFIRMED.